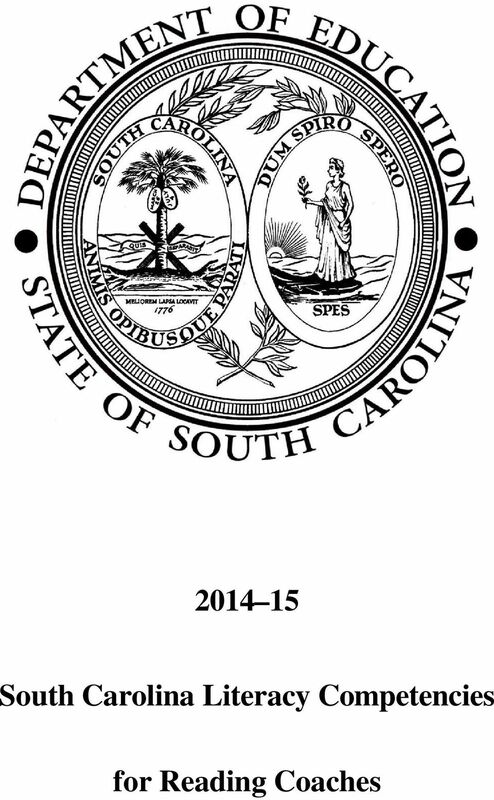 Download "South Carolina Literacy Competencies. 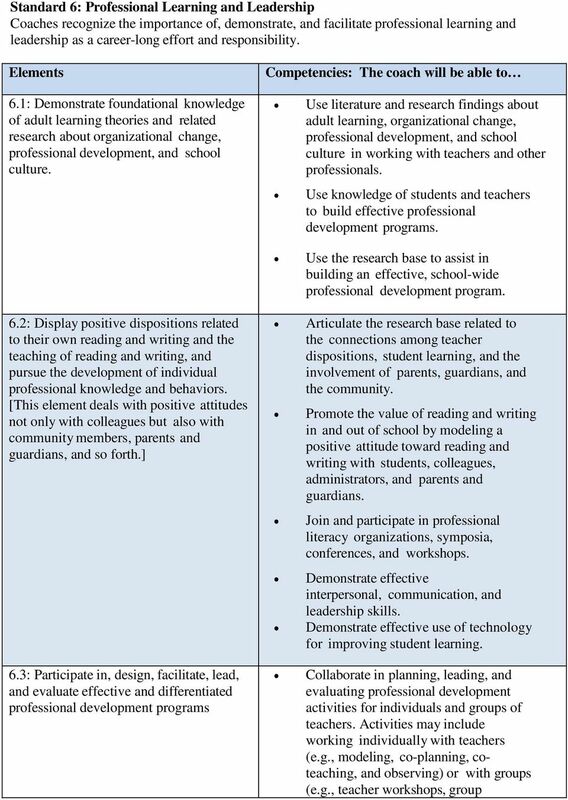 for Reading Coaches"
2 Standard 1: Foundational Knowledge Coaches understand the theoretical and evidence-based foundations of reading and writing processes and instruction. 1.1: Understand major theories and empirical research that describe the cognitive, linguistic, motivational, and sociocultural foundations of reading and writing development, processes, and components, including word recognition, language comprehension, strategic knowledge, and reading-writing connections. Interpret major theories of reading and writing processes and development to understand the needs of all readers in diverse contexts. Analyze classroom environment quality for fostering individual motivation to read and write (e.g., access to print, choice, challenge, and interests). Demonstrate a critical stance toward the scholarship of the profession. Read and understand the literature and research about factors that contribute to reading success (e.g., social, cognitive, and physical). Inform other educators about major theories of reading and writing processes, components, and development with supporting research evidence, including information about the relationship between the culture and native language of English learners as a support system in their learning to read and write in English. 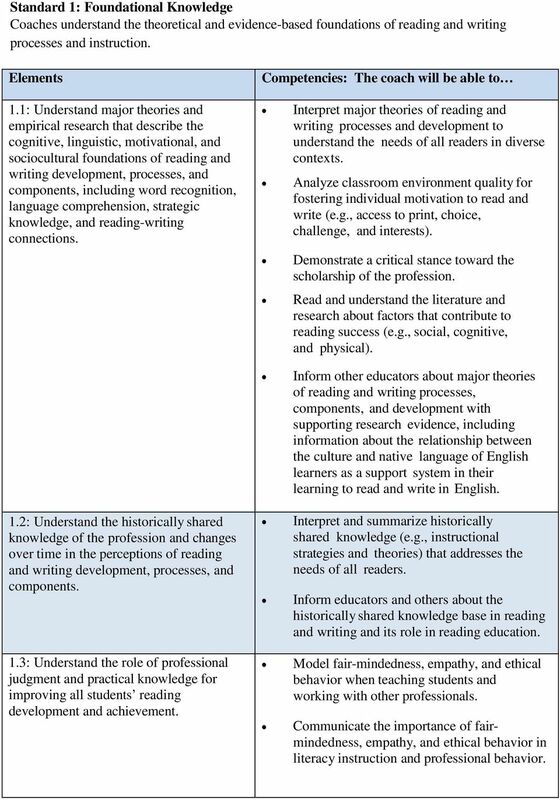 1.2: Understand the historically shared knowledge of the profession and changes over time in the perceptions of reading and writing development, processes, and components. 1.3: Understand the role of professional judgment and practical knowledge for improving all students reading development and achievement. Interpret and summarize historically shared knowledge (e.g., instructional strategies and theories) that addresses the needs of all readers. Inform educators and others about the historically shared knowledge base in reading and writing and its role in reading education. Model fair-mindedness, empathy, and ethical behavior when teaching students and working with other professionals. Communicate the importance of fairmindedness, empathy, and ethical behavior in literacy instruction and professional behavior. 4 and materials collection that meets the specific needs and abilities of all learners. [Reading specialists may provide support through modeling, co-teaching, observing, planning, and providing resources.] Lead collaborative school efforts to evaluate, select, and use a variety of instructional materials to meet the specific needs and abilities of all learners. 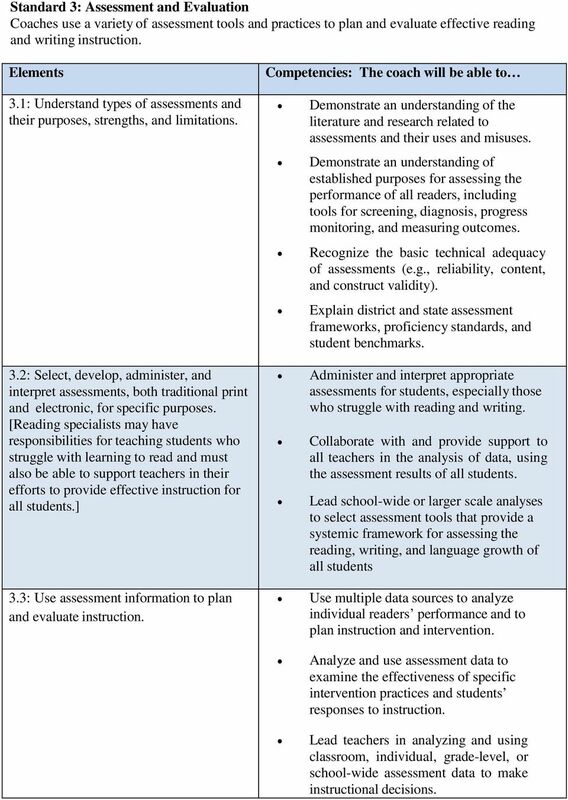 5 Standard 3: Assessment and Evaluation Coaches use a variety of assessment tools and practices to plan and evaluate effective reading and writing instruction. 3.1: Understand types of assessments and their purposes, strengths, and limitations. 3.2: Select, develop, administer, and interpret assessments, both traditional print and electronic, for specific purposes. 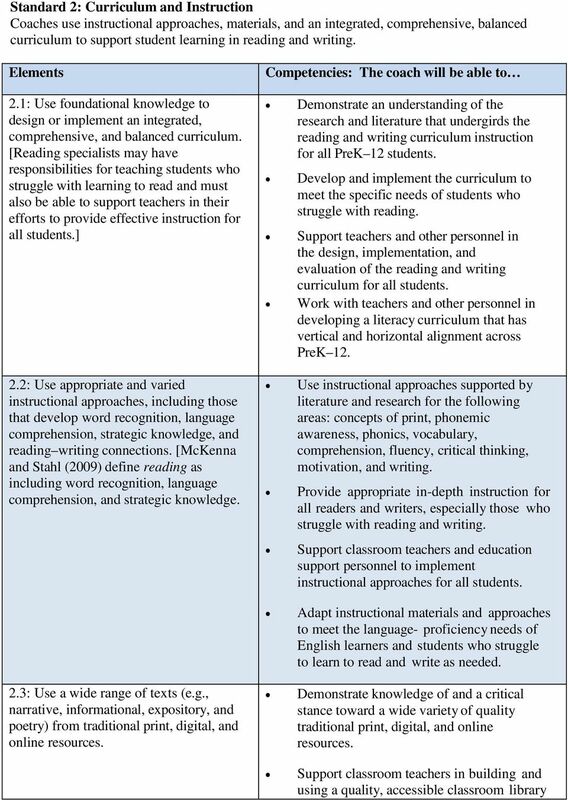 [Reading specialists may have responsibilities for teaching students who struggle with learning to read and must also be able to support teachers in their efforts to provide effective instruction for all students.] 3.3: Use assessment information to plan and evaluate instruction. Demonstrate an understanding of the literature and research related to assessments and their uses and misuses. Demonstrate an understanding of established purposes for assessing the performance of all readers, including tools for screening, diagnosis, progress monitoring, and measuring outcomes. Recognize the basic technical adequacy of assessments (e.g., reliability, content, and construct validity). Explain district and state assessment frameworks, proficiency standards, and student benchmarks. Administer and interpret appropriate assessments for students, especially those who struggle with reading and writing. Collaborate with and provide support to all teachers in the analysis of data, using the assessment results of all students. Lead school-wide or larger scale analyses to select assessment tools that provide a systemic framework for assessing the reading, writing, and language growth of all students Use multiple data sources to analyze individual readers performance and to plan instruction and intervention. Analyze and use assessment data to examine the effectiveness of specific intervention practices and students responses to instruction. Lead teachers in analyzing and using classroom, individual, grade-level, or school-wide assessment data to make instructional decisions. 6 Plan and evaluate professional development initiatives using assessment data. 3.4: Communicate assessment results and implications to a variety of audiences. Analyze and report assessment results to a variety of appropriate audiences for relevant implications, instructional purposes, and accountability. Demonstrate the ability to communicate results of assessments to various audiences. 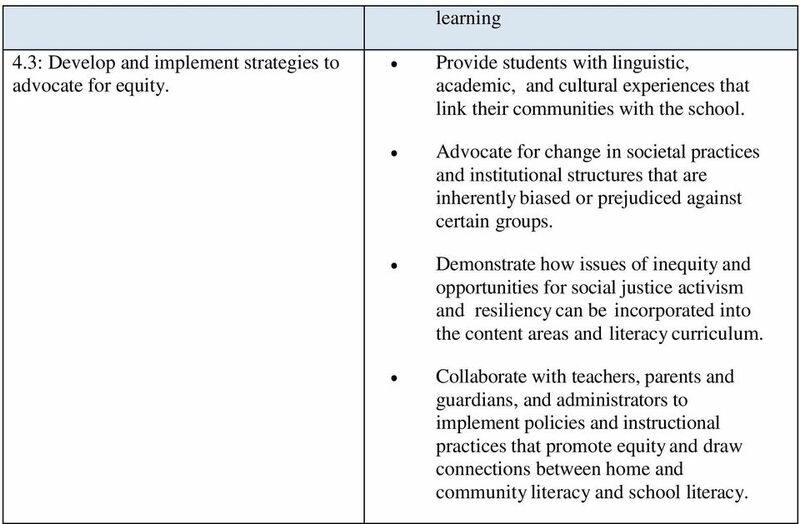 8 learning 4.3: Develop and implement strategies to advocate for equity. Provide students with linguistic, academic, and cultural experiences that link their communities with the school. Advocate for change in societal practices and institutional structures that are inherently biased or prejudiced against certain groups. Demonstrate how issues of inequity and opportunities for social justice activism and resiliency can be incorporated into the content areas and literacy curriculum. 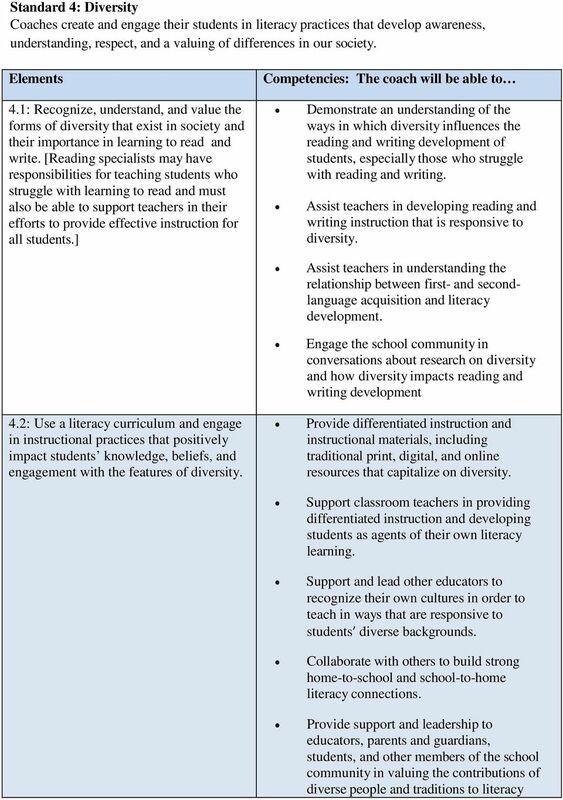 Collaborate with teachers, parents and guardians, and administrators to implement policies and instructional practices that promote equity and draw connections between home and community literacy and school literacy. 9 Standard 5: Literate Environment Coaches create a literate environment that fosters reading and writing by integrating foundational knowledge, instructional practices, approaches and methods, curriculum materials, and the appropriate use of assessments. 5.1: Design the physical environment to optimize students use of traditional print, digital, and online resources in reading and writing instruction. Arrange instructional areas to provide easy access to books and other instructional materials for a variety of individual, small- group, and whole-class activities and support teachers in doing the same. Modify the arrangements to accommodate students changing needs. 5.2: Design a social environment that is low risk and includes choice, motivation, and scaffolded support to optimize students opportunities for learning to read and write. 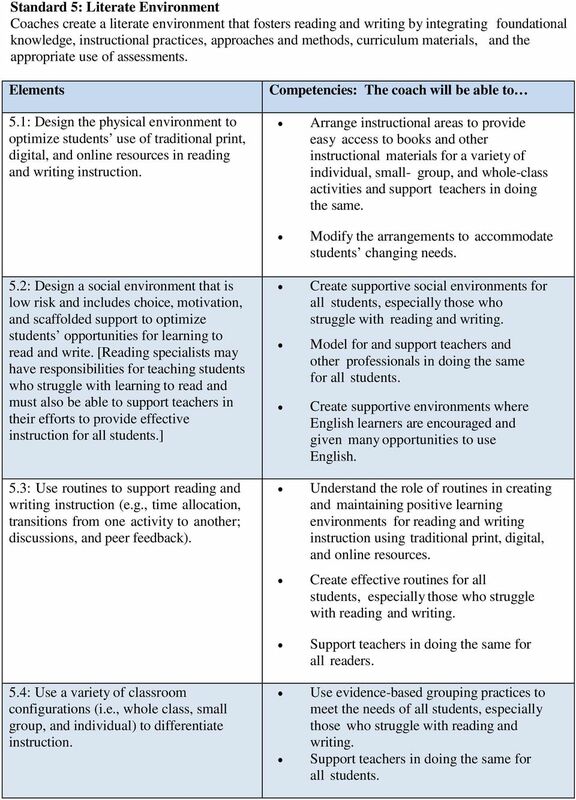 [Reading specialists may have responsibilities for teaching students who struggle with learning to read and must also be able to support teachers in their efforts to provide effective instruction for all students.] 5.3: Use routines to support reading and writing instruction (e.g., time allocation, transitions from one activity to another; discussions, and peer feedback). Create supportive social environments for all students, especially those who struggle with reading and writing. Model for and support teachers and other professionals in doing the same for all students. Create supportive environments where English learners are encouraged and given many opportunities to use English. Understand the role of routines in creating and maintaining positive learning environments for reading and writing instruction using traditional print, digital, and online resources. Create effective routines for all students, especially those who struggle with reading and writing. Support teachers in doing the same for all readers. 5.4: Use a variety of classroom configurations (i.e., whole class, small group, and individual) to differentiate instruction. Use evidence-based grouping practices to meet the needs of all students, especially those who struggle with reading and writing. Support teachers in doing the same for all students. 11 meetings, and online learning). Demonstrate the ability to hold effective conversations (e.g., for planning and reflective problem solving) with individuals and groups of teachers, work collaboratively with teachers and administrators, and facilitate group meetings. Support teachers in their efforts to use technology in literacy assessment and instruction. 6.4: Understand and influence local, state, or national policy decisions. Demonstrate an understanding of local, state, and national policies that affect reading and writing instruction. Write or assist in writing proposals that enable schools to obtain additional funding to support literacy efforts. Promote effective communication and collaboration among stakeholders, including parents and guardians, teachers, administrators, policymakers, and community members. 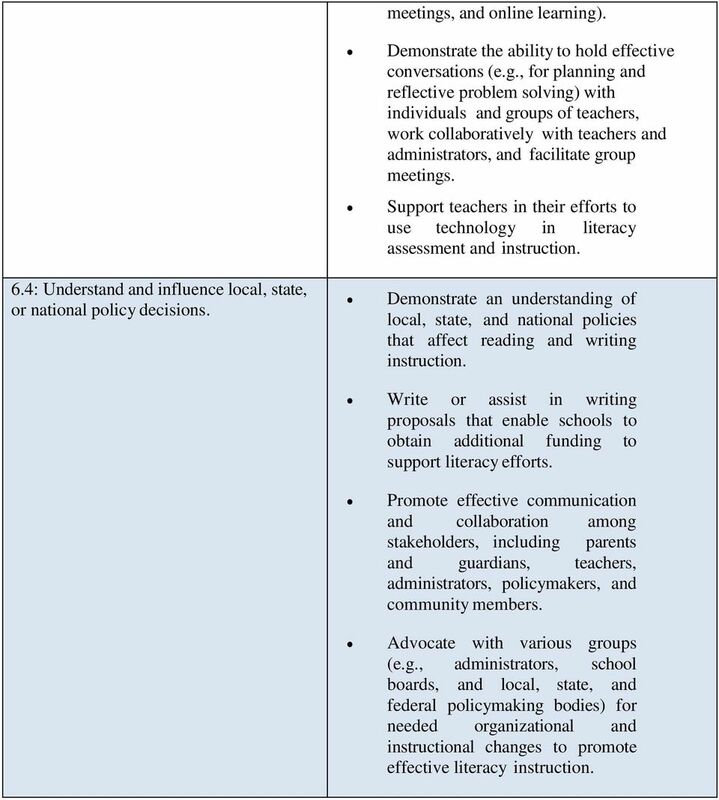 Advocate with various groups (e.g., administrators, school boards, and local, state, and federal policymaking bodies) for needed organizational and instructional changes to promote effective literacy instruction. 2. Course Description: Intensive study of methods and materials appropriate for developing emergent, primary and transitional literacy in grades P-5. Literacy Program Handbook For: Master of Science Degree- Literacy Education Post Master s Certificate- Literacy Specialist Department of Curriculum and Instruction School of Education Dr. Stephanie L.
Reflective Practice: Goals for Professional Growth Library Media Specialist Professional s Instructional Program I integrate the teaching of information skills with curriculum standards and classroom content.